I spent nine whole months preparing for my first baby. I ate right, I kept active and made sure I went to all of my prenatal appointments. After we discovered the baby was a boy, we chose a name (after vetoing a thousand!) We decided to incorporate a Transportation theme into his brand new nursery. Primary colors, trains, trucks and cars! I remember going into his nursery, standing by his empty crib and rubbing my enormous belly. Tears welling up in my eyes because I was just so happy and excited! We were so prepared! My labor was pretty standard textbook and everything seemed great. The hospital allowed us to take this six pound, adorably handsome, fragile human home. It was scary. I was so afraid. Would I hurt him? Can I do this? Can I be a MOM? Am I normal for feeling this way? What if MY mom knew I was so frightened? What if my husband knew? What a failure I must be. Everyone is thrilled to be a new mom! No way other women feel like this. My books told me about those Postpartum Baby Blues, and how they are normal and that it lasts for roughly a few weeks. But, there I was, three months in and falling apart. The generic "How are you?" from the grocer, or co-worker would induce tears. "Fine" was a lie. I was not okay. I was sad. I was anxious. I was depressed. "But why? Everything in your life is so great. You have a healthy baby! What's there to be upset about?" And I still don't know. I'm not a doctor. I don't know why I felt the way I felt. I was loved and supported. There is no rhyme nor reason. It just was. I sought out help. I spoke to my family doctor who referred me to a therapist. I found that medication and a safe place to talk were very helpful. Eventually I felt better. I was able to stop the medicine and the counseling. I am thankful that my husband recognized the signs. He saw that I was down, tired and not wanting to participate in the things we loved. He made it possible for me to not be ashamed. As a doula, I too can recognize those behaviors and I will be there. To support, to listen and to encourage you to get the help that you need. You are normal. It is okay to feel this way. The Issaquah Doula is excited to announce their inaugural Father's Day Photo Challenge. Doulas and Dads make great support teams and we want to celebrate our local fathers. Post a photo on Instagram and use the hashtag #IssaquahDoulaDads, follow and tag @IssaquahDoula and don't forget to share your post on Facebook! Post photos of the Dad in your life being the best dad he can be! 10 entries per participant. Show me what you got! Two bottles of Dad's Little Helper IPA & two Rogue IPA glasses! Courtesy of the Issaquah Brewhouse. Due to prize availability, winner must be local and at least 21 years of age. By submitting photos to this contest you agree that the images are yours, and the Issaquah Doula has the right to showcase them throughout social media; Instagram, Twitter, Facebook & website. The Issaquah Doula strives for the highest standards because our clients deserve nothing less. I am proud to have aligned my trainings with an organization who values professionalism and holds the bar for high standard goals within this industry. ProDoula has taught me Labor, Postpartum and most recently Postpartum Placenta Specialist training with their launch of Placenta Prep. A two-day, hands-on extensive training program where a handful of us learned first hand from our nation's Placenta Specialist, Deb Pocica who has been preparing placentas since 2009. As your Postpartum Placenta Specialist, I will provide you with the required materials above to ensure the safety of the transportation of your placenta. Once you or someone you trust has transported your placenta to your home, I will arrive to begin the 2-day process. I only require your space for about two hours for two consecutive days. Trained in postpartum support, being there in your home during this process is invaluable. The only appropriate place to care for a woman's placenta is in the home of the woman who birthed it. These high standards of excellence are in place for the safety and peace of mind of our clients. As a Postpartum Placenta Specialist, I can support you best when I am with you. I am trained to educate and support you during this period and I want you to reap the benefits of my offerings. Though Placenta Encapsulation is not currently regulated by the state, I believe the standards that ProDoula has set will be ones that will be modeled after. Other organizations encourage their encapsulators to personally transport placentas and process them in their own homes. ProDoula's desire for professionalism prevents their specialists from behaviors like the aforementioned, which dilute the professionalism of this industry. Additionally these practices have the potential to cause uncertainty for the postpartum woman during an already stressful and transitional time. The potential uncertainty of a client is not a risk I am willing to take. Discussing this method with Seattle's Health Department, it was said that the method to prepare the placenta in the client's home is a smart, professional way to conduct this sort of business to prevent the possible spread of bacteria to mother and baby. As a graduate from Placenta Prep and receiving a Certificate of Completion of the Bloodborne Pathogens Standard from OSHA you can feel secure that your Issaquah Doula is professionally trained to treat your placenta with respect and certainty. Have you ever had one of those dreams where a monster is trying to attack you and your voice is trembling and your punch is beyond weak? You keep trying to scream and hit but the monster keeps ascending no matter what. I recently had a similar dream. Except I woke up because my voice got loud. Real loud. YOU ARE NOT MY MOTHER! I hollered over and over again, until my husband woke me and held me as I sobbed into his warm body. So who was this imposter mother? Why was I still sobbing ten minutes later? In my dream I confronted this mystery woman. I listed fact after fact the reasoning behind my meloncholy. How she simply is toxic and harmful to my life. She never shown pride for me. She never had my back. She never will. The fear I felt in the pit of my stomach as she ascended toward me was blood curdling. Thinking of it now, it still makes me cringe. It was one of the scariest feelings I've ever felt, asleep or otherwise. Because the monster in my dream IS my mother. She once longed for me to arrive. Had a clown themed baby-shower to celebrate me. She once nursed me and sang songs to me. I was wanted. But that nightmare I had is my reality. She didn't defeat me. I stood up and faced my fear and screamed into it's face with power. With confidence. With pride. I am not alone in this. I know there are lots of us motherless mothers. Mother's Day is bittersweet. I'm proud of the mother I've become despite the pitfalls I've endured. I'm saddened that the mother I long for is non-existent. She could never mother the way I need. I have learned through counseling that I have grieved for the loss of her, though she is still alive. I've managed my sorrow with meditation and love. I was taught to mother my children how I wish I was mothered and to not only mother them but to mother myself. If my situation rings true for you too, know that you are incredible. You are special. You are loved. You are wanted. I promise. 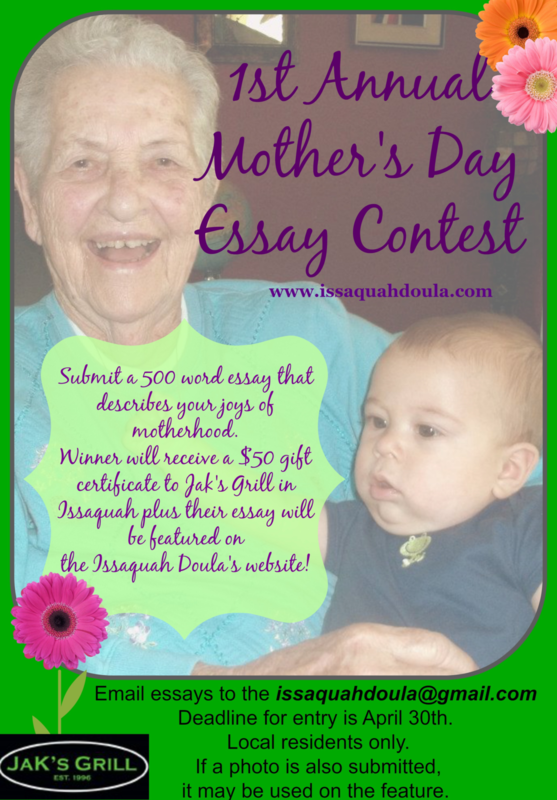 This year was our inaugural Mother's Day Essay Contest. I asked for a short essay describing your joys of motherhood. The winner would receive a $50 gift certificate to Jak's Grill, a delicious steakhouse located here in Issaquah. I read many entries. All of them made me smile, a few brought tears to my eyes! The love you have for your own mothers and the love your children evoke is glorious. Thank you for sharing these with me. I look forward to next year! Happy Mother's Day. From my first day as a mother, I was hit with the hard truth that this wasn't going to be all fun and games. I was "gifted" an infant who never slept. Ever. I say "gifted" because in the depths of despair I remember reading that children are gifts from God, and that God will never give you more than you can handle. I don't consider myself a particularly religious person, more of a spiritual type, but it's funny how much more of a relationship I have with God now that I'm a mother. It usually involves me bargaining with him on the toilet, where most of my praying occurs since that is where I can lock the door and have 30 seconds of peace, trying to summon the strength to get through another day. So at age 25, I remember holding this baby and just crying, pleading for him to sleep so that I could get a few precious moments of rest. With days and nights blurring into one another, I remember holding his soft, downy head against my cheek one night and whispering to him how much I loved him, as tears spilled out of my eyes with sheer exhaustion. For me, these are the moments where I experience the most joys of motherhood. Those moments where you think you will break apart from frustration, where you just want to throw your hands up and say, I'm done with it all, and feel like you want to run away, then you look down and feel a little hand in yours. A hand that is probably sweaty and sticky with who knows what, but that curls itself into yours and a child looking up at you saying, "I love you Mama". Those moments make it all worth it. When the baby you've been rocking for hours finally lets go and drifts off on your shoulder, allowing you a moment to sit down and relax, or when you're potty training your naked toddler and hear a familiar grunt, and leap across all the furniture in your living room like a superhero, in time to catch a little present in your hands before it hits the carpet. Those times where you never thought something was humanly possible, and you were able to accomplish it, most likely while breastfeeding, talking on the phone and cooking dinner at the same time. Those times where you are up the entire night with a sick toddler and nursing an infant thinking to yourself, I just can't go on, but you pour another cup of coffee and keep plodding. Those times where you can hardly recognize the woman you've become, someone who has traded perfect hair and makeup for clothes that have been spit-up on, used as a tissue and as a napkin to wipe messy spaghetti faces. Hair that is thrown up in whatever style that keeps it away from grabby baby fingers. Those times that you wouldn't trade all of it for the world, because at the end of the day every mother knows there's nothing better than looking at your precious angels, sleeping cozily in their beds, knowing that you successfully made it through another day. Nothing better than curling up in your own amazingly comfortable bed, a bed that you spend far too little time in, telling yourself that if you had the choice, you'd choose motherhood all over again in a heartbeat. Throughout my life I have been faced with issues that shape me. I often find myself standing up on my handcrafted soap box with my cheerleader megaphone and pouring my heart out for what I believe in. More often than not, I'm left standing all alone. Except for now. There is a #doularevolution happening. And I'm part of it. This revolution is shaking the ground all across the country and I am responsible for some of the quakes. See, for many years the role of a doula has been deemed our responsibility to society. Culturally women have gathered around women during childbirth to assist them in this primordial transition from woman to mother. I get it. It's in our nature to nurture. But it's time to evolve. The destruction of the common misconception is occurring. What is the common misconception? There are a few. First, is the notion that women NEED a doula. Guess what? You don't. Women have been giving birth since the dawn of time and though birthing with the support of a doula has been proven to drastically improve the outcome of the birth, we are not necessary or responsible for it. You WANT a doula. To educate you, to comfort you, to support your birthing and parenting philosophies. You want the luxury we provide. Two, this bizarre idea that doulas should work for free or for pennies. I think this ideal is stemmed from the nature/nurture thing and it's truly devaluing this profession. Yes, you read that correctly. PROFESSION. This is not a hobby. I am not an #oxytocinvampire. I am a ProDoula; and in more ways than one. So, what's the solution? The plan? My contribution? It's simple. The solution is to promote doulas across the country as professional, certified, businesswomen and men. Get out from under those prehistoric rocks and value yourself and the women you serve. It's okay to earn a living wage! Doulas work. Hard. The plan is to increase the living wage of doulas everywhere by elevating the roles of doulas. We are valuable, important and key players in the birth team. We deserve to be compensated for our time. Though you may think the doulas on this money-mission are greedy, take a moment and ponder how they pay for their training, certification, business licenses, insurance, websites, extended education and tools of the trade. Just one client could consume anywhere from 6-46 hours of doula face-time. (sometimes longer!) It is absurd to think she should be away from her family for this time without being paid. My contribution is to promote this #doularevolution and to shout into my megaphone about how important it is. I may not be the popular vote in my neck of the woods, but like I said before, I'm used to standing alone in my beliefs. The difference is the amount of like-minded support I have from across the globe. Together we are showing the world that we matter. We are making changes. Doulas are succeeding and the ones who balk, badmouth and shame are going to be left trapped in the subterranean bitumen, burned out and broke. Don't you know it's going to be all right? Yeah. All right! I want to hear from all the mothers in my community. Share with me your joys of motherhood. Make me laugh or make me cry! Is it those precious bumps, thumps, and butterflies of your baby within? Or when you first heard your little one exclaim, "I love you!" Maybe it was the time you took photos of them with their Prom date? Share those moments with me, and if I choose your essay as the winner, your beautiful story will be featured here on my blog. Plus, Jak's Grill has graciously donated a $50 gift certificate to the winner! Essay must be no more than 500 words and submitted through email. Send to: issaquahdoula@gmail.com If a photo is also submitted it may be used online with the feature's announcement. Entry deadline is April 30. Winner will be announced May 3. A lot of dads have major reservations about hiring a doula. They think she will get in the way, take over his role and maybe even out-shine him during his wife's time of need. I'm here to tell you these ideas, though valid, are simply not the case. Think of birth as an exotic trip to a foreign city! The two of you are super excited and can't wait to see all the sights together. But there is a problem. You don't speak the native language and you've never driven on that side of the road before! Solution? You hire a guide. This guide is well versed in the native tongue and has seen all the sights in all their seasons. Your guide can navigate the land with ease and help you choose the best restaurants, comfortable hotel accommodations whilst providing you with the knowledge and history of the town. Like this guide, a doula can be your interpreter. She is trained and knowledgeable of all those foreign birthy words like; lochia, perineum, ociput posterior, asynclitism, the ring of fire and so much more! She will assist you in becoming knowledgeable yourself; supporting you to make decisions based on what you've learned. A doula can teach dad how to perform the Double Hip Squeeze and show him different ways to use a Rebozo. A doula can relieve dad while he needs to grab a bite or take a nap; knowing that his wife is taken care of by someone they both know and trust. One of my favorite parts of birth is witnessing the intimacy between a couple. I'm focused on applying strong counter pressure to mom's back, while dad is forehead to forehead whispering how amazingly, strong and beautiful his wife is. Having a doula there to help dad navigate labor and birth is key. So, book that trip! Plan for an amazing getaway with the comfort of knowing you will have a trained guide to help you on your way. We've all seen that awesome 80's movie, Say Anything; the one where he holds up the boombox blasting Peter Gabriel's In Your Eyes, while wearing a fashionable brown trench coat. Did you know it was featured in nearby Seattle? I love movie trivia. In the movie John Cusack's character, Lloyd Dobler remarks, "I am looking for a dare to be great situation." Is it the way you want to birth your child? At home, in a hospital, in a tub? Is it the way you choose to feed your child? With your breast or a bottle? Whatever philosophies you choose, they will be the right ones. My "dare to be great situation" is to provide you with education, support and strength. I do this by being your pillar, your shoulder, your doula. I do see it...in your eyes. You hold the power, the light and the force. You are a mother. You are able. Instead of a boombox, I want to hold up a mirror for you. I want you to see with your own eyes how spectacular you are. It is vital to have a great support team. The overflowing joy and love from those special people is amazing. They provide encouragement, understanding and tons of love. Baby makes his debut during the witching hour? No problem. During the school performance of Romeo & Juliet? Piece of cake. Speaking of cake, we know sometimes those babies arrive on already established birthdays...no big deal. Why? Because having a baby is the most spectacular event that takes place on this planet. All the support makes these events that much more special. The support team I'm talking about is MY family. That's right. My husband and our three sons. They know that my passion is serving you. They get it. They totally understand if I have to leave in the middle of whatever it is we're doing. They see how important my role is as YOUR support team. I am forever grateful for the love and support my family provides. There are a lot of reasons why I doula. The number one reason is: birth is exciting! We've all heard that, "every pregnancy is different" - there is nothing but truth to that statement. It's exciting for me to see the realization on an expecting parent's face when they discover their OWN birthing philosophies; one that is not swayed by anyone. Suddenly she is in control. Of her choices, of her providers, of her birthing location and especially her thought pattern. These positive actions will lead to an outcome that is received and respected by herself; because she was in control and made decisions based on education and intuition. That is why I doula. To be that pillar of education, support and love that defends your birthing philosophy. No matter what.